Mr. Trump, your presidency — I love your presidency. I call it ‘Disgrace the Nation.’ You’re not the POTUS — you’re the BLOTUS. You’re the glutton with the button. You’re a regular ‘Gorge’ Washington. You’re the presi-dunce, but you’re turning into a real prick-tator. Sir you attract more skinheads than free Rogaine. You have more people marching against you than cancer. You talk like a sign language gorilla who got hit in the head. In fact, the only thing your mouth is good for is being Vladimir Putin’s c**k holster. Your presidential library is gonna be a kids menu and a couple of ‘Jugs’ magazines. The only thing smaller than your hands is your tax returns. And you can take that any way you want. It was not expected that the FCC would take action against Colbert as it gives a lot of leeway between 10 pm and 6 am. Taking action against comedians mocking Trump would have a chilling effect on freedom of speech. Colbert’s CBS Late Show will win the 2016-17 TV season in total viewers – CBS’ first win over NBC’s The Tonight Show in overall audience with a season-long host since the 1994-95 TV season. The qualifier excludes the 2009-2010 TV season when NBC replaced Conan O’Brien with Jay Leno midway through the season. Conan O’Brien visited David Letterman on May 17. Neither like Jay Leno. 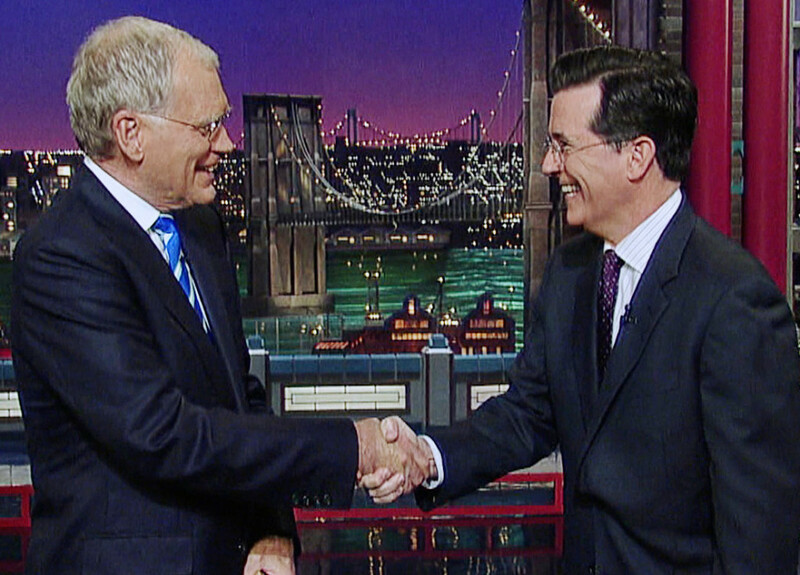 Letterman’s final show airs tonight. One might expect that, in the wake of Williams’s suspension, his colleagues would be brimming with stories of other fanciful tales he told. That’s not the case. There are a few tales, it’s true, but when asked for the unvarnished truth about Williams, the two topics people at NBC News return to again and again are these: his prowess as a bureaucratic infighter and his limited interest in the kind of “heavy” news topics and investigative pieces that had long been championed by such NBC stalwarts as Tom Brokaw and Tim Russert. Williams took the anchor chair in December 2004, after a career handling the news at local stations and MSNBC; though he had worked as NBC’s chief White House correspondent for two years, he was never a foreign or war correspondent. He was deeply insecure about this, some of his friends believe. These people suggest that his storied broadcasts from New Orleans in the aftermath of Hurricane Katrina, which proved a boon to his ratings, were in part an effort to overcome the perception that he was a journalistic lightweight. 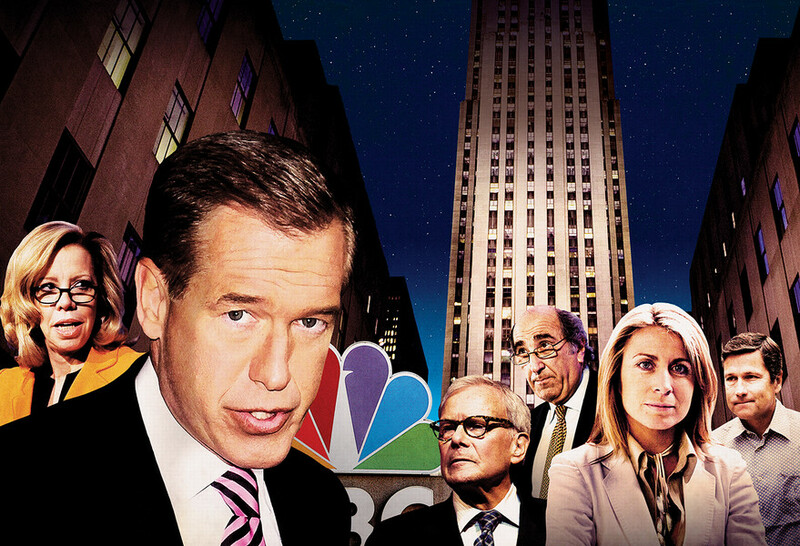 In his first years on Nightly News, several colleagues say, Williams’s weaknesses were kept in check by other strong figures at the network, from Brokaw and Russert to Capus and a Nightly News executive producer named John Reiss. With the departures of each of these men, especially Russert, who died in 2008, Williams slowly consolidated his power. For a while, he was. In fact, as an excellent article by Gabriel Sherman in New York magazine recounted, Williams had long displayed an ambivalence with continuing in the anchor chair. With his abundant charisma and disarming wit, what he truly wanted, it appears, was his own talk show. According to New York, he talked to Steve Burke about succeeding Jay Leno. When Burke refused, Williams reportedly pitched Les Moonves, at CBS, to replace David Letterman, who was soon to retire. Moonves also allegedly declined. Though his appearances on shows such as 30 Rock and Jimmy Fallon successfully repositioned Williams as a good-humored Everyman—and thus expanded not only his own brand but that of Nightly News—they were not popular among many of his colleagues. “He goes on Tina Fey and Jimmy Fallon and all that, that’s where his heart was, and [at NBC] that’s seen as running away from the news division,” says a former NBC executive. After refusing Williams the Leno spot, Steve Burke offered him a consolation prize: his own magazine show, Rock Center, a bid to anchor what he hoped would be the second coming of 60 Minutes. It wasn’t. Rock Center debuted in 2011 to tepid reviews and worse ratings. Its journalistic efforts received less notice than its stunt hiring of Chelsea Clinton, whose signature contribution was the interview she did with the Geico Gecko that appeared on the show’s Web site. White smoke could be seen rising from CBS Headquarters today. CBS will not be going through the same drama which we saw at NBC when Johnny Carson and Jay Leno left The Tonight Show (twice in the case of Leno). There was no consideration of forcing Letterman out before he was ready. One week after David Letterman announced his planned retirement on his own schedule, CBS has announced that Stephen Colbert will be replacing him. While I think Craig Ferguson does an excellent job following Letterman’s show, it was not expected that Ferguson would receive the 11:35 time slot. I do like Ferguson’s show but, if he leaves CBS, it would not be as significant as David Letterman and later Conan O’Brien leaving NBC. I hope Ferguson does remain where he is, providing a choice between his show and Seth Meyers at 12:35. Stephen Colbert has already said that (as would be expected) he is not going to do the show in character as on The Colbert Report on Comedy Central show. It has been an excellent run, but I am also confident Colbert can do a fine job hosting as “himself.” I do hope that from time to time Colbert, instead of stupid pet tricks, goes back into his stupid conservative character for a skit. 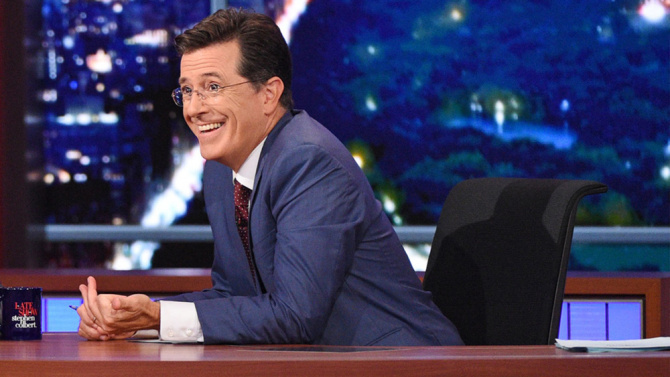 I suspect that Colbert will tone down politics to some degree with the move to a late night network talk show. His liberal credentials are well known after pointing out that “reality has a well-known liberal bias.” Or maybe not. A study at Ohio State in 2009 found that many conservatives took him seriously and didn’t realize he was mocking them. Here’s an expanded edition for quotes about the royal baby–because a compilation of Anthony Weiner jokes would just be too long. Here’s my favorite jokes about the royal baby from five different late night comedians.